…of great food, good friends and beer! Earlier this morning, my friend Debi over at Life Currents posted a recipe for Shrimp & Crab Enchiladas. She & her husband ‘Dan-the-Man’ apparently roam in delicious circles, as their fabulous friend Chad whipped up those incredibly delicious-looking enchiladas. Chad, you’re the man too! Since I wasn’t properly fed or caffeinated yet, what with having skipped breakfast and all, the thought of succulent shrimp & crab flirted with me like a fierce Russian mail order bride until well after noon. By the time I got off work, I knew I wanted shrimp & crab, but we had just feasted on Mexican food yesterday so I was contemplating what to make with it. Then, as by divine intervention, I drove past a Brazilian Ju-Jitsu place on my way to the grocery store, et voila… I know! Isn’t the brain a wonderful thing?! 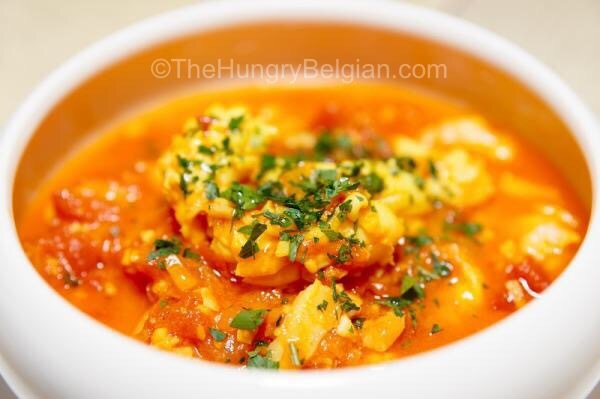 The dish below is actually called “Moqueca”. A quick Pinterest study taught Me that there are about as many versions of “Moqueca” available as there are Brazilian grandma’s, but I read a few recipes and ran with it. I’m by no means proclaiming the dish below is authentic, but it tastes like a sultry day salsa dance on Ipanema Beach, steel drums & all. Perfect for a Monday eve, if you ask me. Serve it over rice or -like yours truly- with a big honk of crusty bread to sop up all the juices. In a large container, toss shrimp with ground cumin, 2 grated cloves of garlic and juice of 2 limes. Set aside for 30 min. In a large heavy pot, add onions & yellow peppers in a bit of oil, season with salt & pepper, and sauté over medium-high heat until vegetables begin to soften. Add diced tomatoes, coconut milk, garlic and juice of remaining 1-2 limes, and bring to a simmer. Simmer until vegetables are soft and sauce begins to thicken somewhat. Add Sriracha and season with salt & pepper to your liking. Add shrimp and all their juices to the simmering vegetable mixture, and cook 15-20 min until shrimp are cooked through. Add crab meat and warm through over low heat. Add chopped cilantro & parsley, and serve immediately. The other day, my workoholic beau private messaged me on Facebook with: “I’d like to try golden milk. I haven’t looked up the recipe online, but it’s supposed to be good for you and give you energy”. At first, I figured his carnivorous self couldn’t possibly have come up with this himself, which instantly made me think that surely he heard it from that cute little barista at his nearby Starbucks. However, since I’m not entirely “Sybil”-like, I quickly suppressed my recessive jealous gene by channeling my non-PMS’ing brain cells, and explained his request as someone who wants to get healthier… and possibly be around me for a long time to come. I’m blessed. So.. challenge accepted, mister. 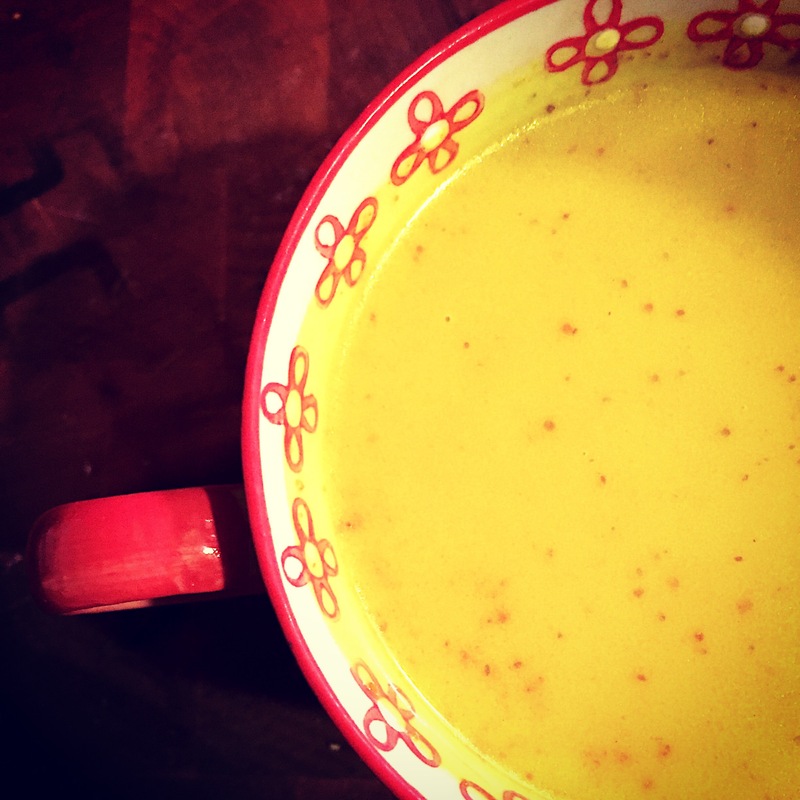 Turns out, golden milk is a staple in Ayurvedic medicine. It’s official name, Haldi ka Doodh, calls for milk to be warmed and steeped with fresh turmeric, fresh ginger and a pinch of black pepper, the latter reportedly boasting your body’s ability to digest turmeric by 2000%. TWO THOUSAND! Whoa. There are a ton of variations available online. As a matter of fact, while I slept comfortably under my rock, it seems ‘golden milk’ rose to frenzied fame on the wellness web. I mean, Gwyneth Paltrow swears by it. Do I need to say more? DO I?! The star players in the various renditions you can find online are always a milky foundation and yellow turmeric. You are free to milk your own cow or goat, but many seem to use coconut milk or almond milk. Since dairy tends to not always agree with the mister, I used coconut milk. Some recipes call for tablespoons versus teaspoons, some tell you to bring the mixture to a boil whereas others warn you not to let the mixture boil to avoid losing the natural benefits of its ingredients. Some creatively hint towards a blend of mulling spices, a good number of them have discrepancies in cup measurements and there is a wild debate between fresh turmeric & fresh ginger versus their powdered cousins. Add in the sheer schizophrenia in its namesake (turmeric tea, turmeric latte, golden milk, golden latte, Haldi ka Doodh…) and you’ve got a recipe that is more confused than a gender-fluid teenager. Firstly, let’s talk turmeric… This ‘spice-du-jour’ is what gives your milky concoction its golden hue. Be forewarned, in its fresh root or ‘paste’-variety, it’s an instant dye for your milk, cutting board or whatever new item of clothing you happen to be wearing. Turmeric’s health benefits come from its plant compound named ‘curcumin’ (“kurkuma” in Dutch, because my Flemish-speaking mom will surely ask me what the heck turmeric is. You’re welcome, mom!). Reportedly, curcumin boasts a wide range of digestive, respiratory and… boom chika chika wow wow… reproductive-health improvements. It’s reportedly also good to prevent cancer and seems to aide liver function. Disclaimer: none of these health benefits are actually backed by scientific research, but then again, free natural stuff impedes on a pharmaceutical exec’s vacation on Bora Bora. I’d say, check it out for yourself and see if you feel better. At the very least, you will have discovered a delicious new drink. Personally, turmeric & I have long been embroiled in a hot affair, as almost all Indian spice blends include turmeric and typically give curry its yellow color as well. Since Scott & I have a thing with warm Indian flavorings, I figured golden milk could very well be good for you and tasty at the same time. I ventured out to Whole Foods, purveyor of all things extraordinary expensive natural & organic, but wasn’t able to find fresh turmeric. I settled on dried, ground spices instead. I used coconut milk from the dairy aisle and added in a small can of coconut cream, because I like things creamy. Pouring everything into a big cast iron pot and letting the mixture warm through, the aroma grabbed me by the nose almost right away. It’s earthy and so warmly spiced, it’s truly a cozy cup of Fall deliciousness. I haven’t tried drinking it cold, but it was very tasty whilst hot and I can assure you I’ll be making overnight oats with this concoction… If you don’t like Indian food, this is likely not going to be your cup of tea. However, if you’re like us and you like warm spices, then this will surely become one of your favorites too. (*) fat aides in the absorption of curcumin, if not using cream, make a spice paste with a bit of coconut oil instead of water. You can also use regular dairy whipping cream. (**) black pepper boasts your body’s ability to absorb the beneficial curcumin (Turmeric) by an impressive 2000%. In a small bowl, mix all ground spices (except saffron & pepper) and make a paste with a splash of hot water. Set aside. In a heavy pot (I used a cast iron Dutch oven), combine milk with cream, spice paste, and cloves. Bring to a gentle simmer, not a rolling boil, until frothy. Turn heat off and let steep for an additional 15-20 min and add a pinch of black pepper. Strain mixture to remove cloves. Finnish with honey (for sweetness) and a pinch of saffron. Serve hot or cold. YES! I love this blog. Send me all new posts!